It happened near Airport Road and Morningstar Drive shortly before 2:30 p.m.
Peel Regional Police said the victim was awake when emergency crews arrived at the scene. Paramedics later transported her to hospital in critical condition. “There was a green light to cross Airport Road from Morningstar. The pedestrian was crossing on the green light and the vehicle we believe was making a right turn on the green light,” Const. Taryn Hill said. Roads have been closed in the area to accommodate an investigation. Anyone who witnessed the crash is being urged to contact police. “We’re asking anyone with dash cam or video surveillance in the area to contact our Major Collision Bureau or Crime Stoppers,” Hill said. 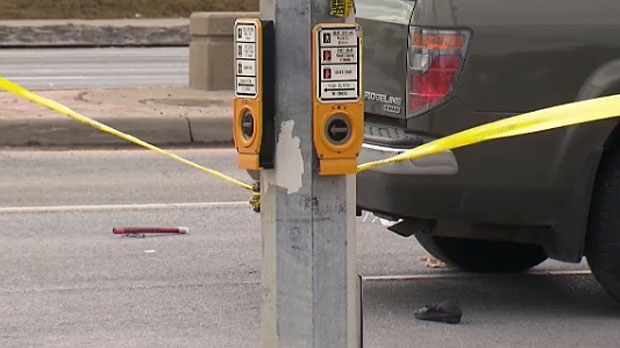 Police tape blocks off a Mississauga intersection after an elderly woman was struck by a vehicle on March 17, 2019.